This beautifully soft love heart cushion is the perfect gift for Valentine's Day and other special occasions. Made from custom printed Suede Vision fabric, filled with plump, fire rated toy stuffing, they're a dream to cuddle against with your loved one. Create a personalised heart cushion and spread the love. When Valentine's Day or a special anniversary approaches, you need to make sure you properly demonstrate your love in a unique way. This personalised heart cushion is the ultimate way to declare your love, ask an important question or commemorate a significant moment. Made from sultry suede vision fabric and filled with the highest quality fire rated toy stuffing, there's no denying its striking appearance. Print your photo and/or message onto the top of the custom heart pillow and bring your feelings to life. Good quality heart cushion.fast delivery bought as a present the person was totally delighted. My cushion is beautiful. The picture is so clear and everyone comments on it when they see it. It’s perfect and it arrived so quickly. No waiting around. It was delivered in just a few days. I’ve used Bags of Love on a few occasions now and I’m delighted with my products every time. Love this "so higher much"
We got a heart cushion with our cat's picture on it for our friend who adores our cat. She cannot get enough of this pillow! She says that she sleeps hugging it and asked me to tell you that she loves it "so higher much" (aka very VERY much, in Ghana-speak). Thank you for a great gift! It's pretty hard to think of a more impressive way to say "I love you" than with your very own personalised heart cushion. As well as these classic three little words, there's another message you could print - 'Will You Marry Me?'. Such a unique way to propose, and what's more, you'll have the cushion as a memento forever. These aren't just for couples in love, as you can create a special custom heart pillow to show the love you have for your friends. Design one for everybody in the group featuring their nickname, a special photo of you all or an inside joke. Unlike friendship bracelets that often break, these are a gift for life, just like your friends. Commemorate your special day with a little gift between the two of you - a personalised heart cushion. It can feature your favourite photo and serves as another memory of the wedding, but one that is private and intimate, not shared with anybody else. It's a unique keepsake you can show future children or grandchildren. Like many of our products, your heart pillow customised with unique photos comes with a quantity discount. When you buy two or more, the price per cushion is cheaper, saving you money. Create a set now and spread the love far and wide. 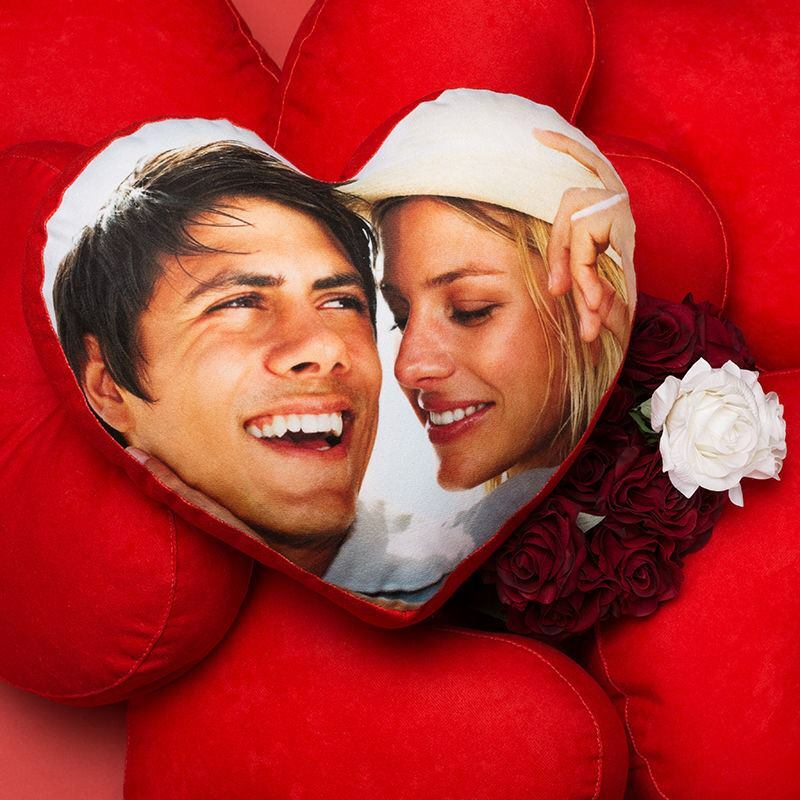 Your personalised heart cushion just radiates happiness and joy. We print your photos onto a piece of suede vision fabric, using a specialist technique so it won't peel away or scratch off. This is then hand sewn to more suede vision fabric printed with a deep, rich red colour, to create the sides and reverse of the cushion. Seamlessly finished, it's a perfect example of the handmade quality that is built to last, just like your love. Care: Your custom heart pillow is a one piece, so there's no cover you have to remove and wash. It's a ready-made plump cushion full of love. Simply surface clean using mild soapy water. When positioning your photo, bear in mind the heart shape where you could lose important features in the little cut-out. When positioned correctly you can frame a face perfectly in a heart. Edit the image to ensure it's in the perfect place, or you can create a photo collage. This is perfect if you want to display a variety of memories to reminisce over. Simply upload a selection of pictures and choose from pre-set montage styles, or rearrange the photos to manually to create your own collage arrangement. Ultra soft velvet cushion available in sizes 41cm sq or 51cm sq, or rectangle 56x41cm. Filling: duck feathers or poly pad. Beautiful heart shaped photo cushion for Valentine . Terrific materials and with amazing print quality. It's a large heart!